The incorporation of fluorides into the mouthrinses appears a logical and practical approach to the problem of delivering fluorides to a large number of persons. A large proportion of the global population use dentifrices and mouthrinse for oral hygiene. Various concentrations, compounds, frequency of rinsing etc., which offers diverse percentages of caries reduction in different types of dentition, have been reported. This systematic review was thus undertaken to critically analyze published literature on the effectiveness of NaF mouthrinses on the prevention of dental caries. To determine the effectiveness of NaF mouthrinses in prevention of dental caries through the analysis of literature. The search strategy for the review was carried out according to the standard Joanna Briggs Institute (JBI) critical appraisal checklist for systematic reviews. The electronic search was carried out in PubMed, Medline, Google Scholar, Cochrane Library, and articles published from 1970 to 2012 (over the past 40 years) were selected. The search terms were NaF mouthrinses, NaF and dental caries, NaF mouthrinse in the reduction of dental caries, the effectiveness of NaF mouthrinse. A total of 613 records were identified as abstracts or full-text articles and were retrieved. Selection, screening, and inclusion of the manuscripts were performed by the first three authors. Only studies published in English language were considered due to the virtual absence of research published in other languages as resulted from preliminary electronic database searches. Gray literature was consulted, and their inclusion was through mutual discussion by all the authors. During the first level of screening, as multiple databases were searched separately, the records were initially checked for duplicates and 44 records were excluded due to duplication. At the second level of screening, 394 manuscripts were excluded as they had various combinations of mouthrinses beyond the scope of this review. Further 174 records were eliminated as the outcome of the intervention in those records was not dental caries. The main outcome of our investigation was a reduction in clinical dental caries followed by mouth rinsing with NaF mouthrinses alone. Hence, a total of 35 records were considered potentially eligible and sought for further assessment as shown in the Flow Chart 1. These 35 records were critically appraised by the first three authors based on JBI critical appraisal checklist for systematic reviews. The authors individually evaluated each study on a checklist provided by JBI Reviewers' Manual: 2011 edition. Those records with unanimous acceptance were included; in the event of a tie-breaker situation, mutual discussions enabled inclusion/exclusion. Seven records were rejected because of the disagreements for inclusion by the authors in aspects of methodology, intervention, and outcome even after discussions. Hence, a total of 28 records were finally included in the systematic review. Total number of studies appraised critically was 35; seven studies were excluded due to lack of consensus among the authors. Of the 28 studies that were included in the systematic review, it was found that studies were conducted during 1971-2012. Further analysis of literature revealed that mainly two concentrations of NaF solutions have been used for mouth rinsing (0.2% NaF solution for weekly rinse and 0.05% NaF solution for daily use). 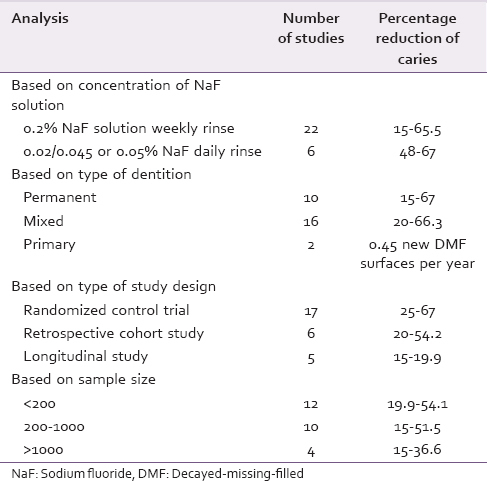 NaF solution at 0.2% concentration weekly rinse resulted in caries reduction of 15-65.5% were as 0.02 NaF solution daily rinse resulted caries reduction over a range of 48-67%. A total of 10 studies were conducted upon permanent dentition with caries reduction range of 15-67%. 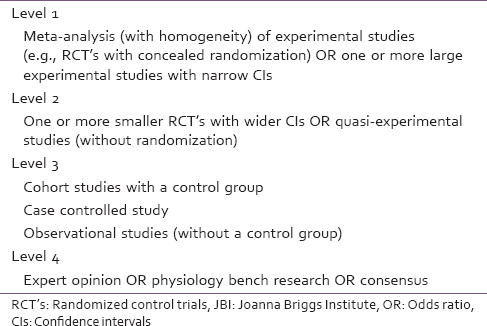 Analysis of study designs as a focus of our investigation revealed that 17 studies were randomized control trials (RCTs). The sample size ranged from 71 to 2900 as shown in [Table 1]. The studies were further analyzed based on the study designs, it was found that the maximum number of 17 studies followed RCT design, retrospective cohort designs were six, longitudinal observational studies were five. The JBI level of evidence was followed in this review as shown in [Table 2]. Most of the RCTs conducted had level; 2 evidence. These studies had a preventive fraction ranging from 16% to 65% and had a weighed mean decayed-missing-filled-surface (DMFS) reduction of studies of 0.76. Mean DMFS reduction for studies, which had intervention in control group other than placebos was 0.44 whereas studies, which had placebo for control groups had mean DMFS of 0.63. Retrospective cohort studies had caries reduction ranging from 20% to 54.2% whereas longitudinal studies had caries reduction ranging from 15% to 19.9%. Level of evidence in these studies was mainly Level; 3. The results of all these 28 studies are compiled in [Table 3]. 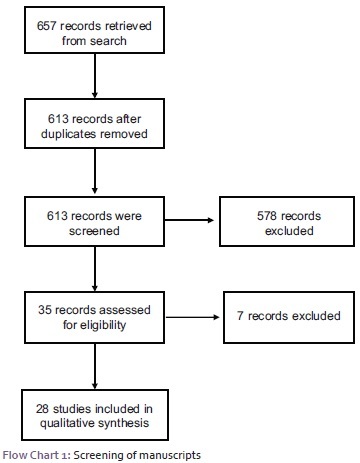 A total of 657 articles were retrieved and 571 records were excluded at various levels of screening and a total of 28 records sought for detailed analysis. Analysis of records shows the overall percentage of caries reduction varying from as low as 15% to as high as 67%, this diverse reduction in caries made us to further analyze the records. Analysis of literature in terms of the effect of NaF mouthrinse on type of dentition revealed that two studies were conducted exclusively upon primary dentition these studies have begun when the subjects were around 3 years and ended when they were 6 years, reporting 0.45 new DMF surfaces per year. Maximum literature was found during mixed dentition period and in most of these studies, rinsing started in primary dentition and continued till subjects were 12 years old, the caries reduction was found to be 20-66.3%. A clearer picture of caries reduction was observed in permanent dentition from 15% to 67%. Most of the literature points to a RCT study design where we found caries reduction of 25-67%. There were around six retrospective studies, which had a caries reduction ranging from 20% to 65.5% and the five longitudinal studies showed caries reduction of 15-19.9%. This systematic review has focused only on NaF mouthrinses (no combinations) and its effect on reduction in clinical dental caries. The preventive fraction for RCTs was 16-65%, which is in contrast to the findings of a systematic review conducted by Marinho et al. and Twetman et al. , The wide range obtained in this review would be possibly because of the inclusion of studies which has consistently given lesser preventive fraction values. The higher reduction values were obtained when NaF rinsing was performed on twice daily basis. Studies having lesser concentration NaF (0.05%) had no significant reduction in DMFS scores. One study by Ripa LW at evidence Level; 1 conducted over a period of 7 years published thrice reported varying preventive fractions of 30%, 55%, and 45% over 5, 6, and 7 years, respectively. ,, The reasons for such a trend need to be further analyzed. Mean DMFS reduction for studies, which had intervention in control group other than placebos was 0.44 whereas studies, which had placebo for control groups had mean DMFS of 0.63. Twelve studies were observational studies falling at level; 3. Since these are observational studies, preventive fraction could not be calculated. The sample size ranged from 120 to 2000 and the reported caries reduction ranging from 15% to 54.2%. A study conducted by Driscoll et al., reported that children who used only NaF mouthrinse had a maximum reduction of 3.57 DMF surfaces per child, an average of about 0.45 new DMF surfaces per year. Whereas in our analysis we found that nine RCTs, which were under supervision showed a mean DMFS reduction of 0.75 whereas nonsupervised fluoride mouth rinsing programs resulted in a reduction of 0.52. To summarize our finding, very limited data are available to clearly demonstrate the effect of mouth rinsing on deciduous dentition. Though published literature suggests that fluoride mouth rinsing programs should be initiated during preschool years, there is a lack of evidence regarding the same. In addition, studies on this group need to be carried out to draw a further conclusion. In this present review, we have found evidence that daily or weekly NaF mouthrinses had a significant caries reduction among adolescents. Daily and weekly/fortnightly rinse programs showed an average of 39% fewer DMFS. Daily use of NaF had a slightly higher caries reduction rate. Not enough data are available to show the effect of fluoride mouth rinsing programs on deciduous dentition. Murray JJ, Rugg-Gunn AJ, Jenkins GN. Fluoride mouth rinsing and dental caries. Fluorides in Caries Prevention. 3 rd ed. Mumbai: Butterworth-Heinemann; 1999. p. 161-78. Forsman B. The caries preventing effect of mouthrinsing with 0.025 percent sodium fluoride solution in Swedish children. Community Dent Oral Epidemiol 1974;2:58-65. Axelsson P. Use of fluorides. Preventive Materials, Methods, and Programs. 1 st ed. Slovakia: Quintessence Publishing Co.; 2004. p. 263-368. Harris NO, Godoy FG, Nathe CN. Topical fluoride therapy. Primary Preventive Dentistry. 7 th ed. United States of America: Pearson Education; 2014. p. 248-72. Karunanathan M. Effectiveness of Fluoride Mouth Rinsing in School Children. Available from: http://www.ses.library.usyd.edu.au/bitstream/2123/4607/1/0293.pdf. [Last accessed on 2015 Apr 28]. Joanna Briggs Institute Reviewers' Manual 2011 Edition. Available from: http://www.joannabriggs.org/assets/docs/sumari/reviewersmanual-2011.pdf. [Last accessed on 2015 Apr 28]. Marinho VC, Higgins JP, Logan S, Sheiham A. Fluoride mouthrinses for preventing dental caries in children and adolescents. Cochrane Database Syst Rev 2003; 3:CD002284. Twetman S, Petersson L, Axelsson S, Dahlgren H, Holm AK, Källestål C, et al. Caries-preventive effect of sodium fluoride mouthrinses: A systematic review of controlled clinical trials. Acta Odontol Scand 2004;62:223-30. Leske GS, Ripa LW, Sposato AL. Posttreatment benefits from participation in a school-based fluoride mouthrinsing program: II. Results after three to five years of rinsing. J Public Health Dent 1982;42:222-7. Ripa LW, Leske GS, Sposato A, Rebich T. Supervised weekly rinsing with a 0.2 percent neutral NaF solution: Final results of a demonstration program after six school years. J Public Health Dent 1983;43:53-62. Ripa LW, Leske GS, Varma A. Effect of mouth rinsing with a 0.2 per cent neutral NaF solution on the deciduous of the first to third grade school children. Am Acad Pedod 1984;6:93-7. Driscoll WS, Nowjack-Raymer R, Selwitz RH, Li SH, Heifetz SB. A comparison of the caries-preventive effects of fluoride mouthrinsing, fluoride tablets, and both procedures combined: Final results after eight years. J Public Health Dent 1992;52:111-6. De Sousa Mda L, Wagner M, Sheiham A. Caries reductions related to the use of fluorides: A retrospective cohort study. Int Dent J 2002;52:315-20. Driscoll WS, Swango PA, Horowitz AM, Kingman A. Caries-preventive effects of daily and weekly fluoride mouth rinsing in an optimally fluoridated community: Findings after eighteen months. Am Acad Pedod 1981;3:316-20. Neko-Uwagawa Y, Yoshihara A, Miyazaki H. Long-term caries preventive effects of a school-based fluoride mouth rinse program in adulthood. Open Dent J 2011;5:24-8. Takeuchi R, Kawamura K, Kawamura S, Endoh M, Tomiki S, Taguchi C, et al. Effect of school-based fluoride mouth-rinsing on dental caries incidence among schoolchildren in the Kingdom of Tonga. J Oral Sci 2012;54:343-7. Asl Aminabadi N, Balaei E, Pouralibaba F. The Effect of 0.2% sodium fluoride mouthwash in prevention of dental caries according to the DMFT index. J Dent Res Dent Clin Dent Prospects 2007;1:71-6. Horowitz HS, Creighton WE, McClendon BJ. The effect on human dental caries of weekly oral rinsing with a sodium fluoride mouthwash: A final report. Arch Oral Biol 1971;16:609-16. Ripa LW, Leske GS, Levinson A. Supervised weekly rinsing with a 0.2% neutral NaF solution: Results from a demonstration program after two school years. J Am Dent Assoc 1978;97:793-8. Ripa LW, Leske GS. Two years' effect on the primary dentition of mouthrinsing with a 0.2% neutral NaF solution. Community Dent Oral Epidemiol 1979;7:151-3. Hausen H, Heinonen OP, Paunio I. Fluoride exposure combinations and caries in permanent dentition among Finnish children. Community Dent Oral Epidemiol 1981;9:108-11. Molina MX, Rodriguez FG, Urbina T, Vargas S. Effect of weekly mouthrinses with 0.2% neutral NaF solution on caries incidence in first permanent molars. Odontol Chil 1989;37:176-82. Hirokawa K. Supervised daily mouth-rinsing with a 0.023% weak acid NaF solution. Results of a school-based program started at the age of four. Kanagawa Shigaku 1990;25:221-35. Baez MX, Brown JP, Porteous NB. Fluoride-Associated Caries Initiation, Progression and Remineralization: A Three-Year Preventive Field Trial foe Mexican - American Hispanic School Children Using Fluoride Mouth Rinse. The University of Texas Health Science Center at San Antonio;1990. 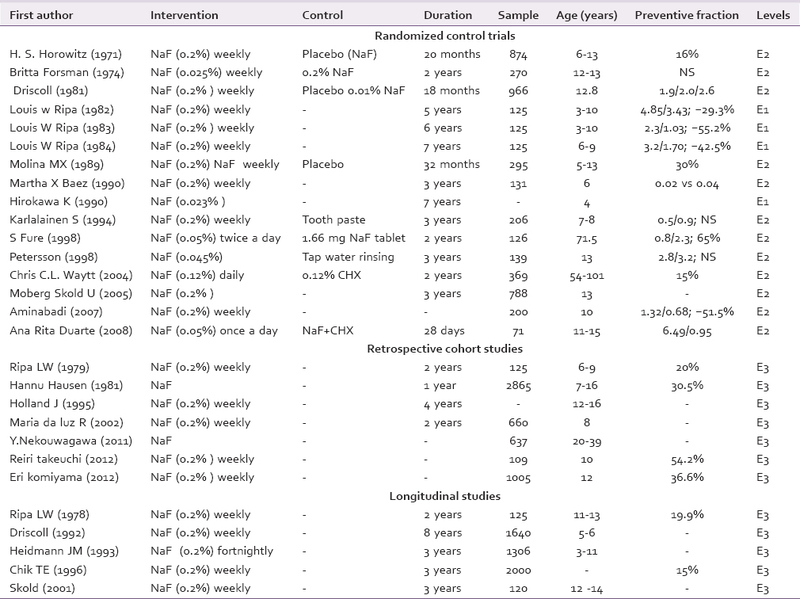 Heidmann JM, Arnbjerg D, Poulsen S, Kirkegaard E, Laurbjerg L. Development of caries in a group of Danish school-age children after cessation of systematic fluoride rinsing. Ugeskr Laeger 1993;155:2995-8. Karjalainen S, Eriksson AL, Ruokola M, Toivonen A. Caries development after substitution of supervised fluoride rinses and toothbrushings by unsupervised use of fluoride toothpaste. Community Dent Oral Epidemiol 1994;22:421-4. Holland TJ, Whelton H, O'Mullane DM, Creedon P. Evaluation of a fortnightly school-based sodium fluoride mouthrinse 4 years following its cessation. Caries Res 1995;29:431-4. Chikte UM, Lewis HA, Rudolph MJ. The effectiveness of a school-based fluoride mouth rinse programme. J Dent Assoc S Afr 1996;51:697-700. Petersson LG, Svanholm I, Andersson H, Magnusson K. Approximal caries development following intensive fluoride mouthrinsing in teenagers. A 3-year radiographic study. Eur J Oral Sci 1998;106:1048-51. Sköld UM, Lindvall AM, Rasmusson CG, Birkhed D, Klock B. Caries incidence in adolescents with low caries prevalence after cessation of weekly fluoride rinsing. Acta Odontol Scand 2001;59:69-73. Wyatt CC, MacEntee MI. Caries management for institutionalized elders using fluoride and chlorhexidine mouthrinses. Community Dent Oral Epidemiol 2004;32:322-8. Moberg Sköld U, Birkhed D, Borg E, Petersson LG. Approximal caries development in adolescents with low to moderate caries risk after different 3-year school-based supervised fluoride mouth rinsing programmes. Caries Res 2005;39:529-35. Duarte AR, Peres MA, Vieira RS, Ramos-Jorge ML, Modesto A. Effectiveness of two mouth rinses solutions in arresting caries lesions: A short-term clinical trial. Oral Health Prev Dent 2008;6:231-8. Komiyama E, Kimoto K, Arakawa H. Relationship between duration of fluoride exposure in school-based fluoride mouthrinsing and effects on prevention and control of dental caries. ISRN Dent 2012;2012:183272. Fure S, Gahnberg L, Birkhed D. A comparison of four home-care fluoride programs on the caries incidence in the elderly. Gerodontology Assoc 1998;15:51-60.